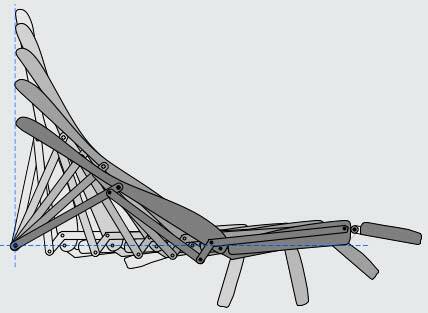 This was an exercise in mechanical engineering to design a linkage for a reclining chair so that the chair could recline without the back touching the wall. This was Steve Hines' first paid consulting project, done while a second year design student, for the head of the Product Design department at NCSU. This mechanism is now used in LazyBoy and other reclining chairs. This product is not for sale. Do not contact us to purchase this product. This project is shown only as an example of past projects. HinesLab currently offers consulting in the area of industrial design, novel solutions to your problems as well as a variety of licensable technology.